It was a totally different experience for me when I was spending time with my friends during last Christmas in the States. Coming from a tropical climate country and experiencing snow was something awesome. But I had a problem with the weather as it was freezing cold. No matter how many layers of clothes I had on, I was shivering from head to toes. Worst still when it came to sleeping time. I had 6 layers of clothes on with a thick woolen blanket over me and yet I did not get much of sleep. The chill crept up to my injured bones and not even my faithful Perskindol Swiss Therapeutic Gel could stop the pain I had to bear on all my joints. I had cried nightly, yearning to be home and warmly tucked in my bed even before my vacation ended. I almost gave up the idea of visiting more sites when one of my friends invited me to his home. I thought it was a bad idea to intrude into the privacy of his home since he has quite a large household of members. To my surprise, I ended up spending the rest of my 2 weeks’ vacation there without any more discomfort. It was like a heaven there, not only with the great hospitality but with a great accommodation. 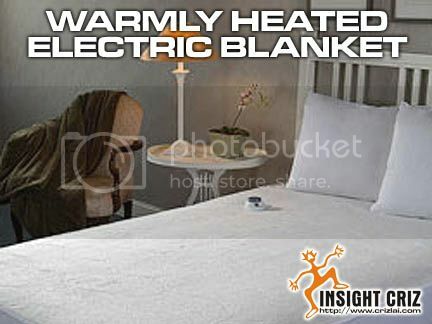 I had a well heated room all by myself and my bed came with an electric blanket. It was almost like sleeping in my own warm bed. The blanket has its own patented safe & warm technology features and all I need to do was to set the timer right. It even came with self automated shut down and the heat was so evenly distributed. Now I know what would be the most important thing to have during my visit to any country during winter time. Previous PostPrevious CHAOTIC MOMENTS WHEN MY HARD DISC CRASHED!